Here we highlight those things that we have seen recently but may disappear soon! There are two Major Nichols frames for sale at Hilary Stone. His site concentrates on quality lightweights. I have copied the photos and text descriptions from his site with the hope that they go to someone who appreciates them! The second is under offer and the details have been saved for later use. I have also added a little extra detail that may help the first description. Photos are courtesy of Hilary Stone and the frames will be ultimately recorded in our Gallery with his permission. The frame has been brazed with cable guides to take bar end shifters, typical of the period. Nice to see the Nervex Pro fork crown which is far from common on even on his Nervex frames. The lesson about refinishes has been learned by many MN owners in recent years that the old school has gone and so have original transfers. H Lloyd produce the reliable copies but your refinisher will probably get Major’s wrapover decoration wrong. Make a full tracing of the wrapover edges and the double fishtail motif so that you can insist they get it right! Even the best refinishers can fail! 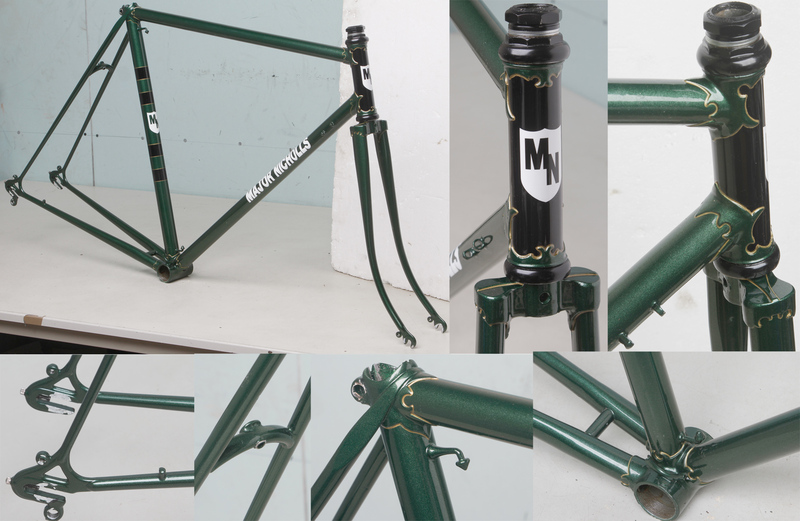 The solution for this frame could be refinishing the headtube and seat tube panels and using the 5 Reform Street knights head, shield and flag head and seat tube decals and creating a new down tube panel for the proper text. Or start again from scratch! A nice frame custom built for Speeds I think from the shop record. We need an accurate frame number complete with full stops used as punctuation to confirm that it is the one we think. Have a look at MN 65.9.6 to see a similar frame and Majors approach to a finish in the mid 60’s.